B.Ward Urban Legend: The Stories Pile Up. The more I look into Slenderman, the more stories of him I seem to find. Everyone says he doesn't want the knowledge of his existence to get out, so I have to be careful with sharing this information. The first story I found was from a user on somethingawfulfourms.com. 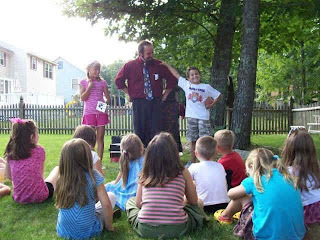 I found the post telling of a boy named Jake around the age of 7. The boy seems to be fascinated with drawings of pictures of him and a tall man in a black suit with out a face. 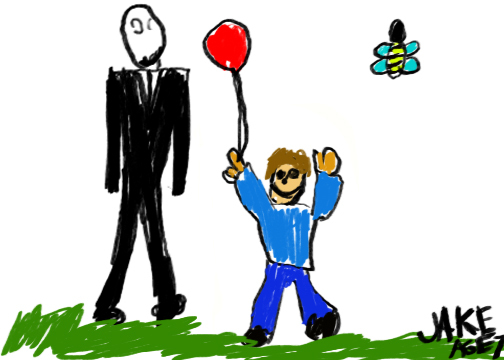 A picture of the boy with what appears to be Slenderman in the background is included. 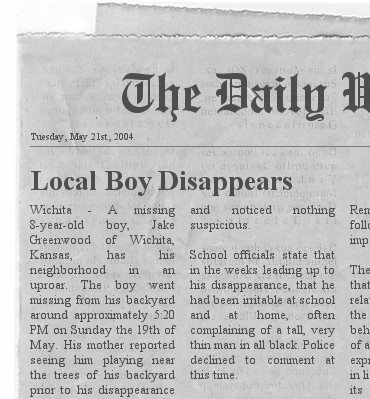 According to a newspaper clipping dated May 21, 2004, Jake Greenwood disappears from Wichita, Kansas on May 19th, 2004. Paper includes that Jake's mother saw him playing near woods in their back yard right before his disappearance , and the Jake had been irritable lately and complaining of a tall thin man in black. Steinmen Woods, Subjects where hunting in the woods four hours before dark. The surviving subject claims both men grew uneasy as a fog set into the woods. Not long after an object falling out of tree stuck one of the men in the left shoulder causing him to discharge his weapon. Object said to be the body of a man of unknown age. It was very precisely dissected, with major internal organs still contained within the rib cage in what looked to be clear bags. Surviving subject placed organ bag in his backpack. Attack followed several minutes later after a "low children's laugh, like a giggle". Surviving subject ran until he reached his vehicle. Subject then drove to assumed safety. Survivor label B7 witness, B7 witness to be placed in quarantine. ---. To Create Paranormal Images," Somethingawfulforums.com. 13 June 2009. Web. 22 October, 2012. He seems to be the main source of all the Slenderman information, maybe even the original creator of this entire Urban Legend. Still I believe there may be some truth to this and am not willing to give up till I find substantial evidence.